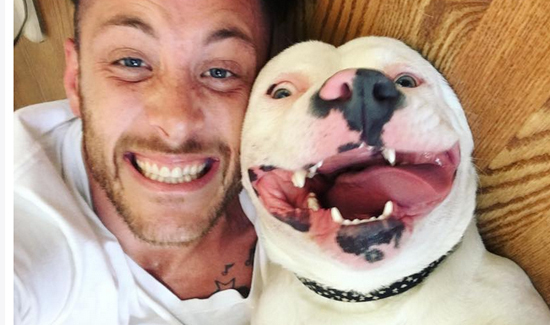 A Michigan family is facing bad news, after a photo of their grinning dog went viral. Local police are saying the dog can’t stay with his new adopted family after receiving calls from police claiming it is a pit bull. The breed is banned from the family’s Metro Detroit township. The owner, musician Dan Tillery, simply wanted to adopt a dog, when he found Diggy. The companionship was clearly mutual, as evidenced by the photo of Diggy’s million-dollar smile. A few days after Tillery took Diggy home from the Detroit Dog Rescue, the police came knocking on his door. Some people who saw the photo believed Diggy looked like a pit bull and immediately notified the police. The Rescue classified Diggy as an American Bulldog, not a pit bull. Still, the resemblance was too shocking to viewers, who were alarmed thinking the township would be at risk.